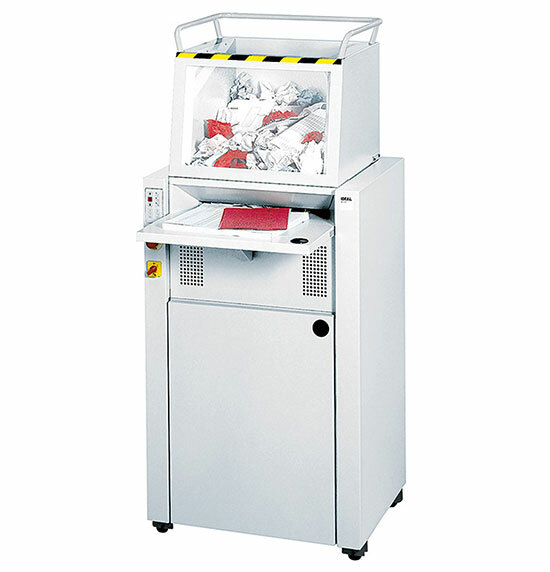 Compact shredder with feed hopper for centralised use. Fold-away feeding table: The fold-away feeding table is ideal for inserting flat paper. A photo cell automatically starts and stops the cutting head when using this feed opening. Feeding hopper: Should a paper jam occur, the electronically secured feeding hopper can be tilted for safe and convenient clearing. Feeding paddles: Crumpled paper is fed into the shredding unit by rotating rubber paddles in the feeding hopper of this shredder model. Mobile shred bin: The shred bin on castors is easily removable through the front door. The shredder stops automatically if the door is opened.